This last weekend, down in Colorado Springs Slacklinevisions was invited to come and be some entertainment for Gearonimos’s grand opening. The store caters to all athletes, from climbing gear, tents, skis, snowboards, hockey gear, great outdoor clothing to weight lifting equipment, Gearonimo has it. Their staff has a lot of experience in the world of athletics and will be able to point you in the right direction of your idea of fun. So if you live in Colorado Springs or are just passing through, Gearonimo has the gear you need! 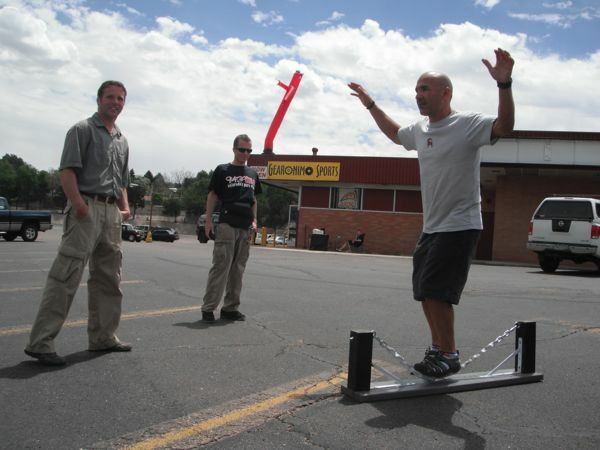 Upon arriving at Gearonimo’s store, co-owner Peter, and I began to scope out an ideal spot for slacklining. After looking at the possible setups in their big parking lot, we decided to go ahead and set it up closer to the road so all of the traffic passing by would see. Where we setup was pretty cool, the parking lot rose above the road about 15 ft or so, and in the background stood Pikes Peak which rise’s above 14,000 feet . As for the rigging it was another interesting setup to add to the list. Kids- do not try this at home. One pole, two ladders, a Jetta and a slacklining kit and we had a solid system which was very complicated to set up. Once the set up was complete, it was time to Slack! 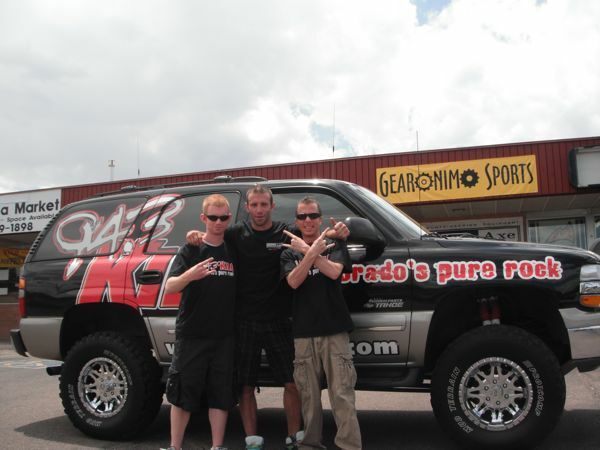 Along with some other entertainment the guys from 94.3’s radio station were there to celebrate the grand opening of Gearonimo as well. At one point they even got to try it themselves. 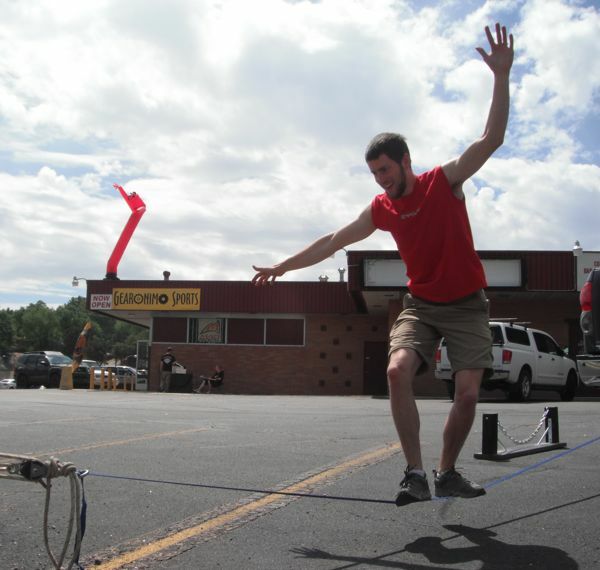 As the day went on, we set up another, smaller slackline off a hitch on a truck so other people could try it. The temp had to be around 90 or at least it felt like it. After five hours of slacklining, the sky above looked like it was about to rain, so it was time to start dismantling the crazy slackline set up. With everything all packed in the car, I went in to checkout the store. Buying a few items, and talking about the days events, it was time to say our goodbyes. I would like to thank Peter and Lisa for giving Slacklinevisions an opportunity to represent the slackline community in such a way. Another Slacklinevisions adventure for the books.